As you've probably read in previous posts, PopMuse was selected by American Express to be one of their "Enthusiasts". Early on I made a vow that this blog was going to be based on things I feel passionately about (good or bad). I don't post or advertise, sponsor or promote anything that doesn't have PopMuse's stamp of approval. And long before this Enthusiast stuff started, American Express Rewards Program played a big role in my life. When Bloghungry and I were knee deep in all things Baby Planning, we had to be incredibly tight financially, we scrimped and saved for years before we started on the baby path. It is not cheap for 2 gay men to have a child (no mater which path you take to parenthood.) Between Agencies, Lawyers and Doctors we were completely tapped out by the time fatherhood was becoming a reality. Every penny we both made had to go to the expanding debt we'd amassed. Which left us with no money for recreation, and damn it, we were still going to have some fun. The evening started in the Wine Cellar (pic) with a toast from the fierce Margaret Mondavi (who had a real Diana Vreeland quality) and John Besh's passed Hors d'ourves including alligator empanadas (no joke). Then we were seated in an intimate dining room, only 14 tables, maybe 100 people max. Dave and Besh came out to face the excited crowd and offer up another toast (there were many toasts). 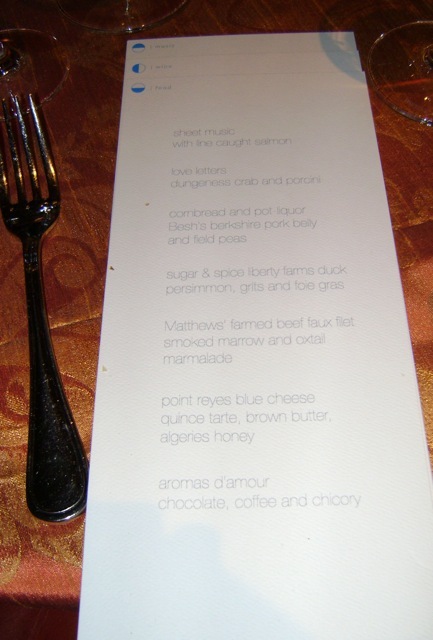 Then Mathews disappeared (for hours) to eat/drink privately, while Besh took the stage with each of his 7 courses of food. See menu HERE. Dave was sort of present through the 3 hour dinner in that he selected certain songs to play while each course was served. The selections even had their own menu (cute detail). 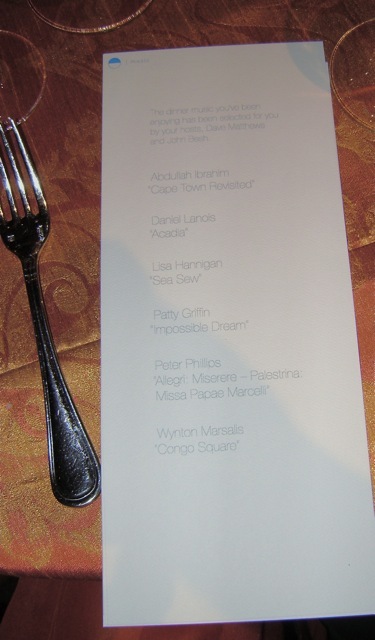 See pic of menu HERE. Eventually after the Quince Tart with Blue Cheese Ice Cream was served, Dave reappeared and performed a 10 song acoustic set. The word 'intimate' is an understatement, he riffed with the spirited (get what I did there) crowd, spoke about the food, poked fun at himself, and seemed to generally enjoy the experience of playing to such a small crowd of foodie fans. For more musings on the food of the evening go to Bloghungry.com. American Express approached me to be an “Enthusiast” because they thought my obsession with travel, music, gadgets, entertainment and food related to specific Charge Card Rewards and benefits Am Ex offers. They told me they were looking for bloggers who would be willing to use an American Express Charge Card and share my experiences using it on my blog – and on their site. When American Express reached out to me, they gave me the following “terms of engagement” that they asked me to follow: · Be transparent and disclose my relationship and anything I’ve received as a result of my relationship with American Express. · Be honest about my opinions. · Offer suggestions and concerns. · Clearly articulate when I am being compensated – by cash or in any other way – for consulting or other duties I may perform. · Shared this policy openly and publicly.